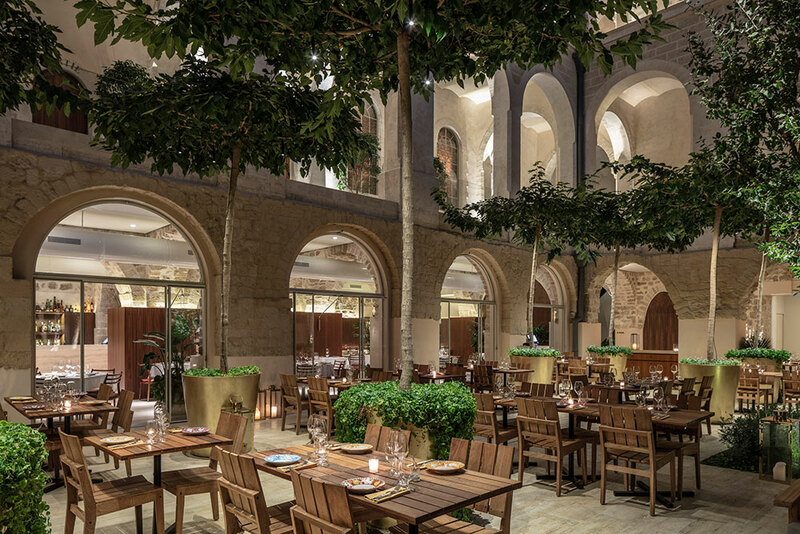 The 4,000-year-old Israeli city of Jaffa has suddenly acquired a new and youthful persona. Built up the side of a low hill overlooking the Mediterranean, the city and its natural harbor have been of strategic and commercial importance for millennia. In the 10th century B.C., King Solomon imported the cedars of Lebanon for the construction of Jerusalem’s First Temple through the port of Jaffa, while in the 1920s and ’30s the famous Jaffa oranges exported by Zionist pioneers provided the primary economic foundation for their expanding settlements. With the birth of the state of Israel in 1948, Jaffa was largely depopulated and the old Arab city, with its narrow alleys and closely packed houses, became an extension of southern Tel Aviv, or Tel Aviv-Yafo, as the conurbation is known. But today, after decades of comparative decline, Jaffa is suddenly buzzing and fashionable, with a rapidly expanding roster of restaurants, cafés, galleries, boutiques and hotels. 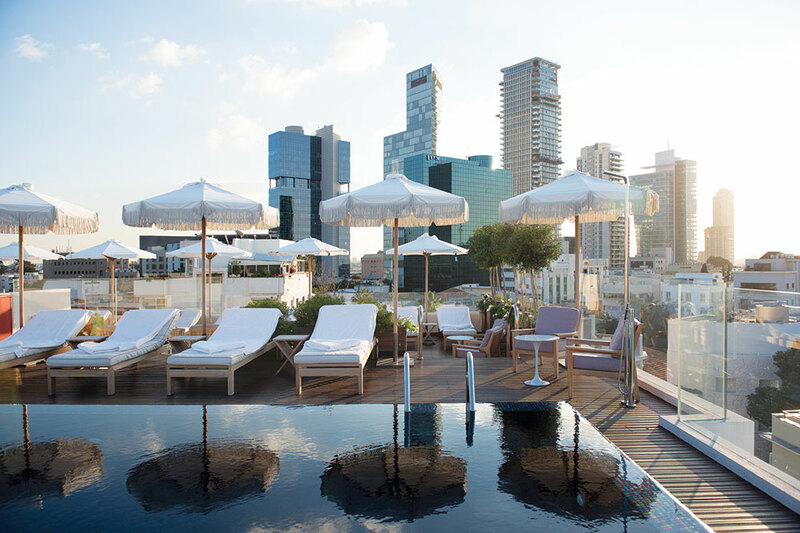 April 2018 saw the debut of The Setai Tel Aviv, a sibling to the nexus of fashion and celebrity in Miami Beach. 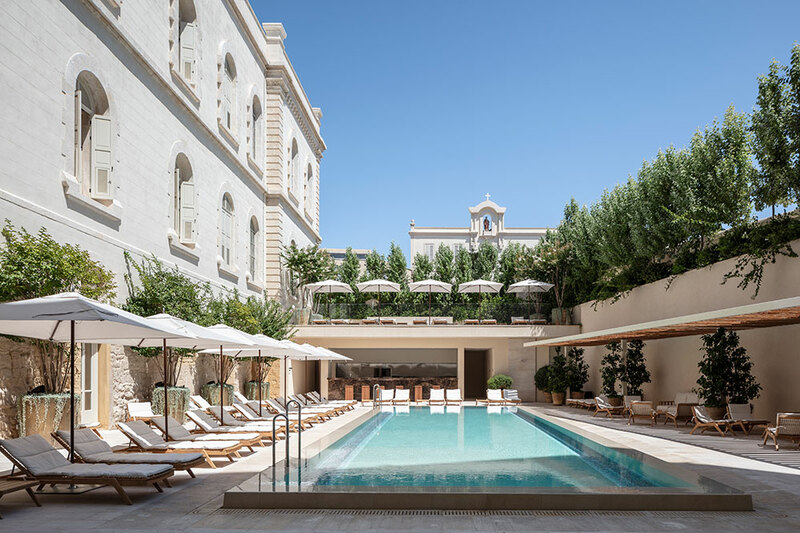 And then in August, it was joined by The Jaffa, a hotel designed in part by British architect John Pawson, known internationally for his refined minimalist aesthetic. 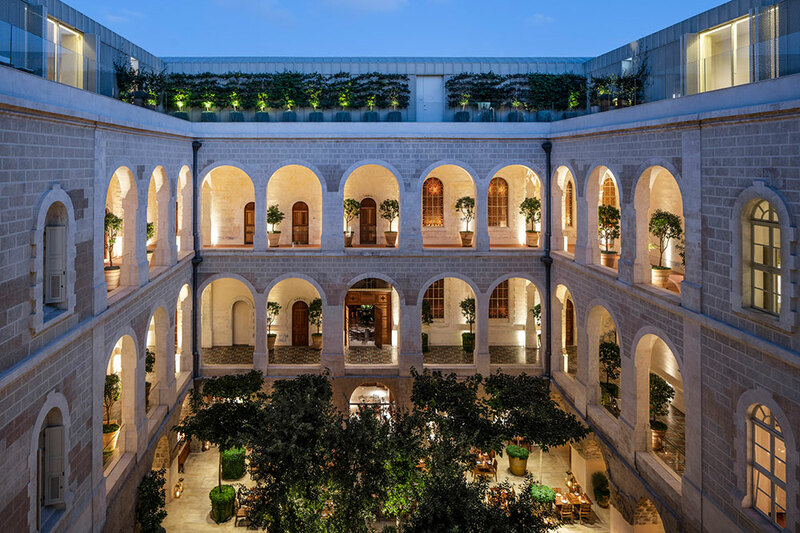 I say “in part” because the core of The Jaffa is a 19th-century French hospital and monastery, to which Pawson (aided by Israeli architect Ramy Gill) has added a modern extension. The complex and ambitious project, which lasted more than a decade, was financed by New York real estate tycoon Aby Rosen, owner of (among numerous other things) the Seagram Building, Lever House and Gramercy Park Hotel in Manhattan. With 120 rooms and suites, The Jaffa is quite a sizable property, but it doesn’t feel like a big hotel. While it would be a stretch to describe it as a hideaway, it is tucked in the middle of the Old City, surrounded by traditional houses constructed during the centuries of Ottoman rule. And its exterior is relatively self-effacing and does not dominate the surrounding district. I arrived one afternoon to find myself greeted by a pair of cheerful bellmen, who seized my belongings with gusto and led me down a long entryway, screened by arabesque trellises, to the lobby. 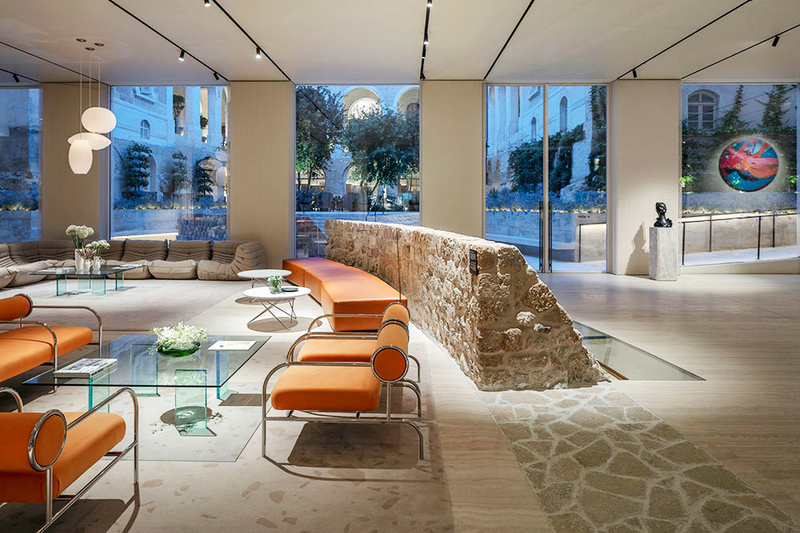 A large open-plan area, with a pale travertine floor, modern furniture by Japanese designer Shiro Kuramata and paintings by Damien Hirst — Rosen is an avid collector of contemporary art — its most surprising feature is a stretch of a 13th-century wall, part of a Crusader bastion that was uncovered during the construction. This extends into an adjoining courtyard and is visible through a large glass wall. Rooms at The Jaffa are divided between the historic and contemporary wings. My Deluxe Sea View room was part of the Pawson extension and came with a small balcony from which I could gaze over the rooftops to the Mediterranean. At 334 square feet, I found it slightly cramped, but the ingenious use of substantial mirrored cupboards made it look bigger than it actually was. Light travertine floors, excellent bedside lighting, a large work desk, ample hanging space, inspired color photography by Israeli artist Tal Shochat and a complimentary plate of dates, apricots and figs all contributed to a congenial environment. The bath was well-lit and came with a single rectangular sink and a sizable walk-in shower but lacked a tub and natural light. In general, I was content, but if I were making my reservation again, I would opt for a larger accommodation, probably a Deluxe Junior Suite (474 to 538 square feet) in the historic wing, where the rooms are more atmospheric and have high ceilings. 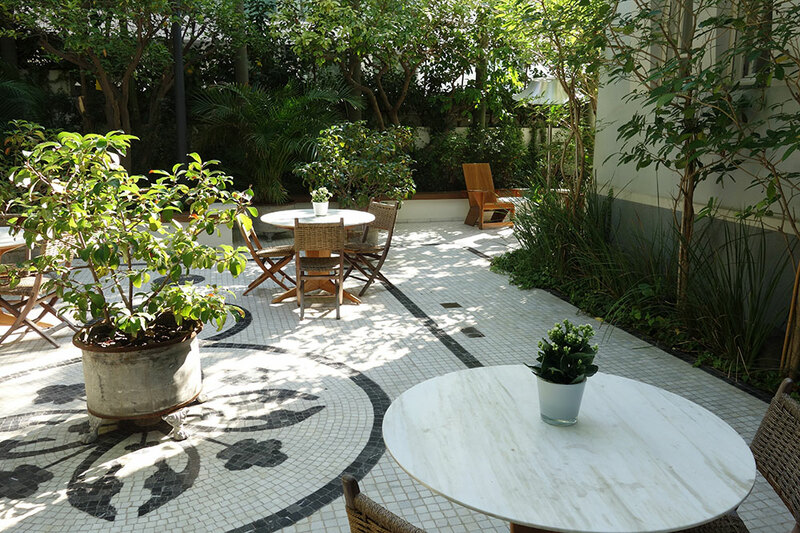 Going on a tour of exploration, I descended to the lobby bar and then strolled out into the courtyard created by the intersection of the old building and the new wing. A green and peaceful space with mature trees, potted shrubs and beds of lavender, it is an idyllic spot in which to read and relax. Nearby, I found the swimming pool, which, with its white umbrellas and neat rows of loungers, is similarly enclosed and serene. For dinner, I opted to try Don Camillo, the hotel’s principal restaurant, which has an Italian menu. This seemed surprising — and possibly a mistake — given that Tel Aviv is now renowned for its imaginative reinterpretation of healthy Middle Eastern and Mediterranean food. Chef Roi Antebi collaborates with the New York-based Major Food Group, whose restaurants include The Pool and The Grill in Rosen’s Seagram Building on Park Avenue. It was a benign fall evening, so I opted for a table on the patio. Not feeling particularly hungry, I ordered an octopus salad, followed by gnocchi with shrimp, accompanied by a Yarden Brut Rosé from the Golan Heights. Although the wine had a local provenance, the rest of my meal seemed more evocative of the Amalfi Coast. Still, the servers were consistently friendly and enthusiastic, and not for the first time that day, I reflected that the young staff at The Jaffa were well-trained and consistently agreeable. The hotel’s other dining option is Golda’s Delicatessen, which, despite being named in honor of former Israeli Prime Minister Golda Meir, also seems rather out of place, being a fragment of Brooklyn inexplicably teleported to Tel Aviv. After dinner, in search of a digestif, I headed upstairs to the old wing’s deconsecrated chapel, which now serves as a glamorous cocktail bar. Alas, a corporate function was underway and I could only peer in through a half-open door at the stained-glass windows, arched ceilings and ornate plasterwork. Other amenities at The Jaffa include a 4,500-square-foot L.RAPHAEL Beauty Spa with six treatment rooms. A large gymnasium with four saunas provides an impressive range of Technogym equipment, but it is poorly lit and rather gloomy. If you prefer to exercise in sunshine, the hotel has a stable of complimentary bikes and helmets. The combination of dignified old buildings and refined contemporary design; the tranquility of the courtyard and pool; the energetic and friendly staff. The lack of a restaurant with a sense of place, serving food representative of Tel Aviv and modern Israeli cuisine. Jaffa’s famous flea market, Shuk Hapishpeshim, is a three-minute walk from the hotel. Rates: Lowest Rate: Classic, $750; Editor’s Choice: Deluxe Sea View, $930. From Jaffa, it is a short taxi ride to the so-called American Colony, a quiet area at the edge of Neve Tzedek, the original Jewish neighborhood constructed outside Jaffa’s city walls. 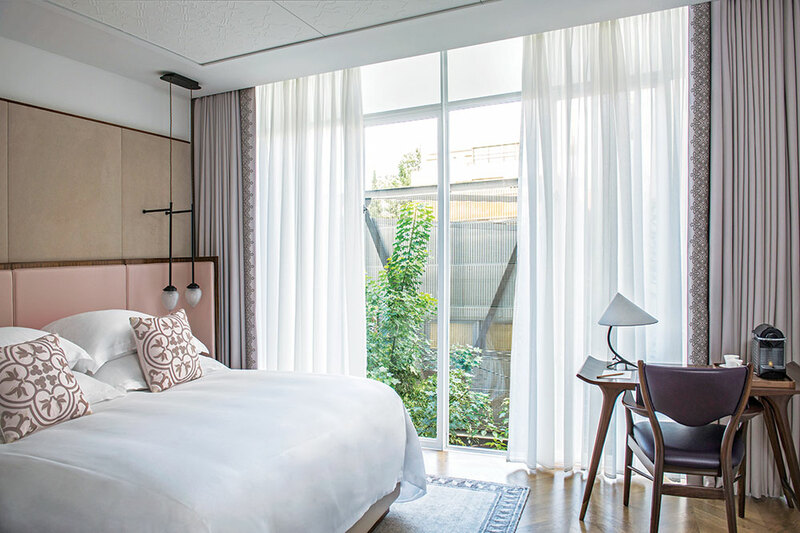 The Drisco Hotel, a 42-room boutique property, opened in June 2018 as an incarnation of the once-famous 19th-century Jerusalem Hotel. In 1866, 40 American families arrived in Jaffa, led by George J. Adams, a self-proclaimed prophet and founder of New England’s Church of the Messiah. Their mission was to prepare the land for the second coming of Christ, and they arrived equipped with agricultural machinery as well as prefabricated wooden houses (some of which still stand) identical to those in their native state of Maine. Among the pilgrims were John and George Drisco, who, rather than tilling the soil, decided to go into the hotel business. Unfortunately, the brothers ran out of money and were obliged to sell the property to Ernst Hardegg, a German hotelier. From 1870 until World War II, when Germans were suddenly no longer welcome, the Jerusalem Hotel was among the most lavish in Palestine. Despite its colorful history, The Drisco proved a disappointment. The restored building is a handsome limestone structure with a grand arched doorway and wrought-iron balconies. However, when I arrived, two staff members were slouching on the steps and completely ignored me as I struggled into the lobby with my suitcase. The main public area on the first floor is a grand salon with marble columns, hand-painted walls, a long bar and several seating areas. 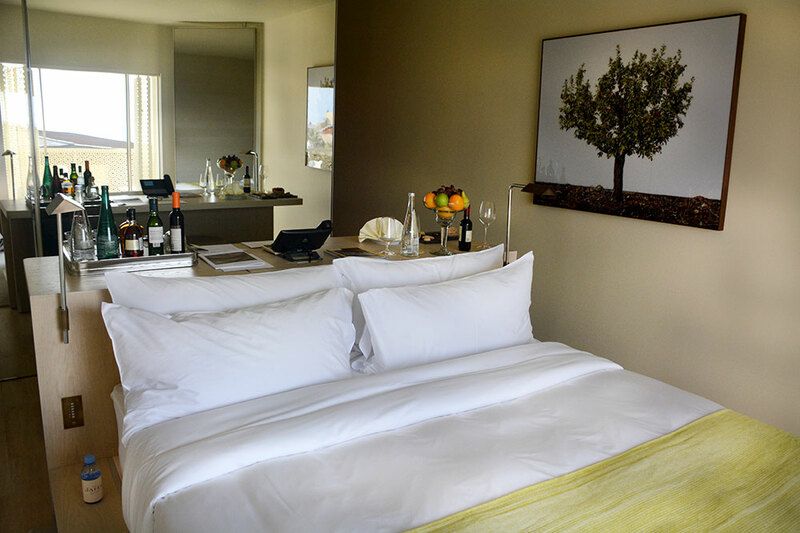 Check-in takes place in a separate room to one side. I had reserved a Deluxe Room but had clearly not been paying sufficient attention to the hotel’s website at the time, as this turned out to be a mere 270 square feet. There was barely room for me to squeeze between the bed and the narrow work desk, while the “luxurious marble bathroom with a walk-in shower” was also minuscule. Doubtless if I had booked a suite instead, I would have been feeling much less grumpy. Heading back downstairs, I discovered that the hotel’s restaurant, Zada, where I had been hoping to try the advertised Ottoman-inspired food, had closed. I perched on a stool for a bar snack instead and contemplated my next-day departure without regret. The striking main salon, with its marble columns, murals and long bar counter. The small rooms (only suites should be considered); the absence of a real service ethos; the lack of a restaurant. The nearest beach is a pleasant 10-minute walk away. During the 1930s, many German Jews fled to Palestine to escape the Nazis, bringing with them the prevailing architectural idiom. Today the most vibrant part of downtown Tel Aviv is the “White City” — the main artery of which is palm-lined Rothschild Boulevard — which contains more than 4,000 buildings in then-fashionable Bauhaus style. The Norman hotel comprises two buildings, one containing 30 rooms, the other housing 20 suites, connected by a garden planted with citrus trees. 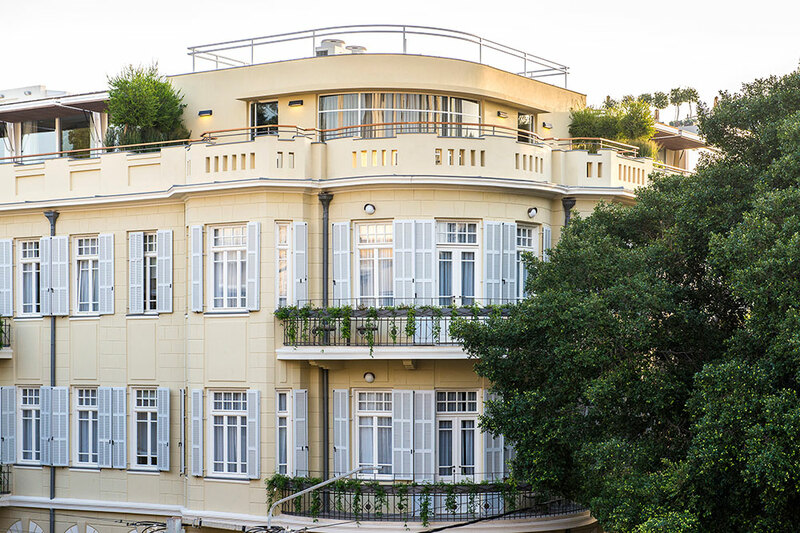 The property opened at the end of 2014 and has since become one of the centers of fashionable life in Tel Aviv. 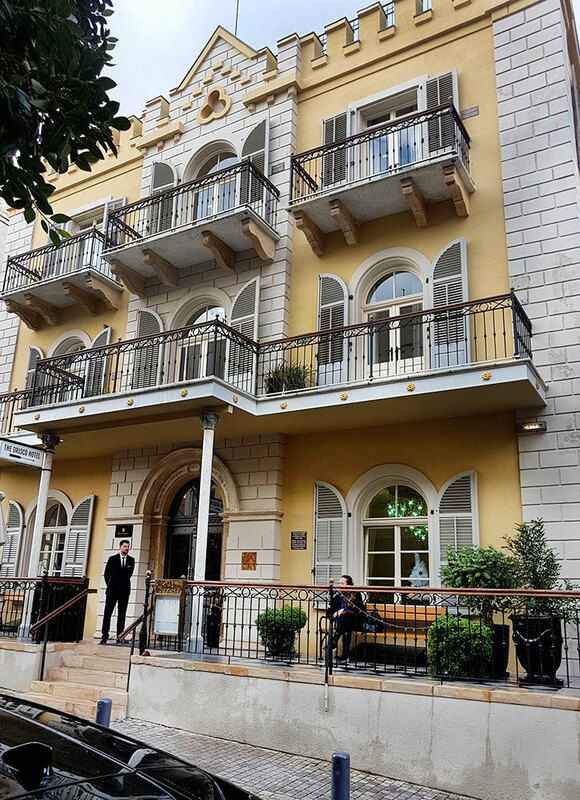 The hotel is named for Norman Lourie, a filmmaker whose Palestine Film Company achieved recognition with a documentary about life on an early kibbutz, “House in the Desert,” which won acclaim at the 1948 Venice Film Festival. Later, Lourie opened a resort, Dolphin House, on the Mediterranean coast south of the city of Nahariya. (During an extended stay there in the late 1950s, Leon Uris wrote his best-selling novel “Exodus.”) His son, Jonathan Lourie, founder of a London-based investment firm, spent years buying all the apartments within the two buildings to create a 50-room boutique hotel. This was my second stay at The Norman, so I should have known better, but once again, I found that I had made an inappropriate room choice. My Deluxe Room was quite claustrophobic at just 290 square feet, so I immediately inquired what other accommodations were available. I was in luck and was able to transfer to The Loft (No. 15) in the neighboring suites building, which has a separate private entrance and serves as a hotel within a hotel. For those in search of privacy, as well as more space, the suites are ideal. Despite its misleading name, The Loft proved to be a junior suite, with high ceilings, tall windows overlooking a residential side street, a separate seating area, a sofa, an armchair, a work desk and a restful color scheme of sage green and gold. 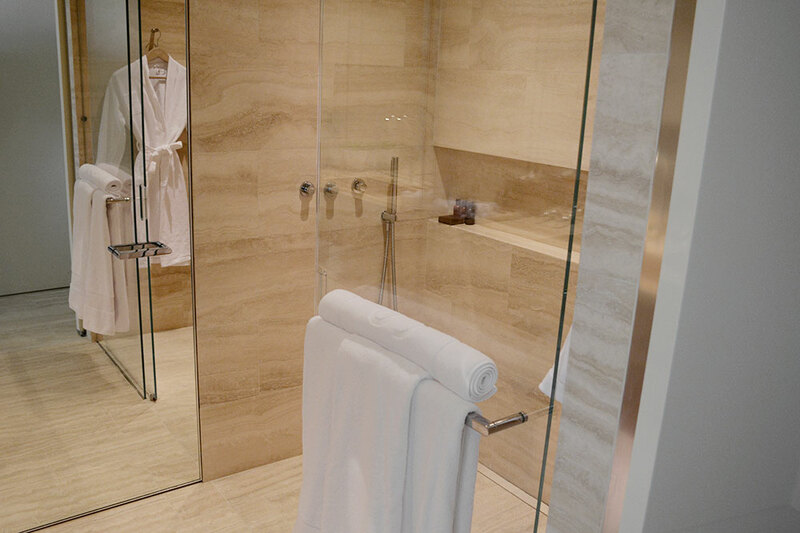 The bath provided a single large sink, a walk-in shower and an ample tub. Presumably because the room hadn’t been occupied for several days before, the water that ran into the tub was brown at first and smelled musty, but the problem disappeared after two or three minutes. The only other irritation was the phone, on which the direct-dial buttons for housekeeping, reception and room service did not work, obliging me to request services via the operator. 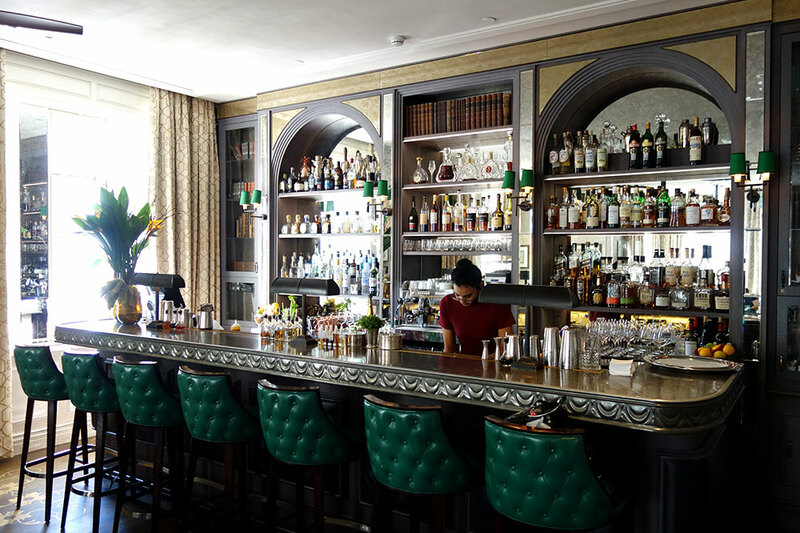 The ground floor of the main hotel building is a constant whirl of social activity, thanks to the popularity of both the principal restaurant, Alena, and The Library Bar. Chef Barak Aharoni’s Mediterranean cuisine is deservedly acclaimed, and I enjoyed a delicious Sunday lunch of assorted mezzes, followed by organic spring chicken with a pink pepper marinade, lemon zest, sage and palm sugar. Unfortunately, the restaurant’s success has bred a degree of arrogance among the young staff, some of whom seem to have a remarkably high opinion of themselves and a correspondingly low opinion of the paying customers, a trait that was also apparent in the bar when I returned to the hotel in the evening. The following morning, breakfast outside on the restaurant’s sunny terrace was more successful. I thoroughly enjoyed my shakshuka (eggs cooked in a sauce of tomatoes, chile peppers and onions and spiced with cumin, paprika, cayenne pepper and nutmeg), but my guest’s scrambled eggs were severely overcooked. Another dining option at The Norman is provided by Dinings on the third floor, a casual Japanese tapas restaurant, with a view of the Tel Aviv skyline. On the floor above, there is a tiny and impractical gymnasium, plus a 60-foot horizon pool with rows of white loungers and a view of the distant Mediterranean. Overall, The Norman is a distinctive and stylish boutique hotel with an ideal downtown location and a lively and cosmopolitan atmosphere. However, the management should remind some staff members that they are working in a service industry, not appearing in a movie in which they play the leading roles. The striking Bauhaus architecture; stylish interior design; the delicious Mediterranean food in the Alena restaurant; the rooftop pool; the tranquil patios and gardens. Rooms in the main building tend to be small; the gymnasium is tiny; some members of the staff can be arrogant and unhelpful on occasions. 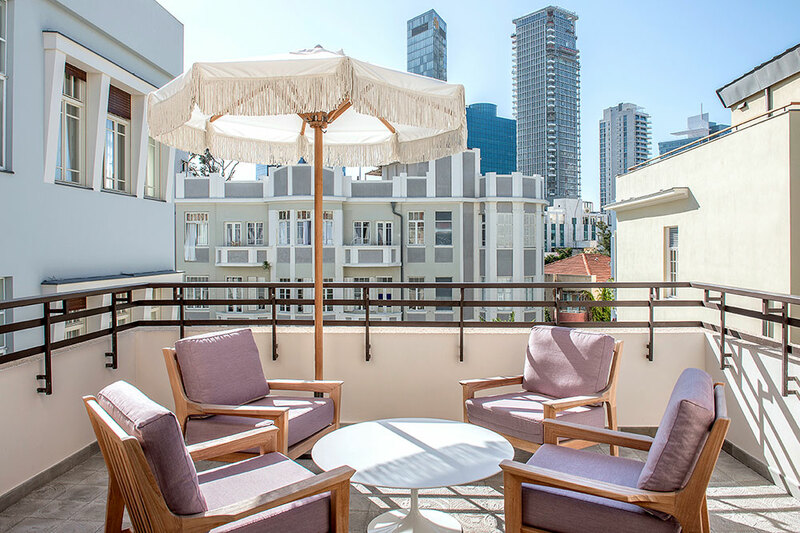 The Norman offers an art concierge service for those who want to become acquainted with Tel Aviv’s vibrant cultural scene on private tours to studios and galleries. Parts of the hotel’s own contemporary-art collection are also for sale.